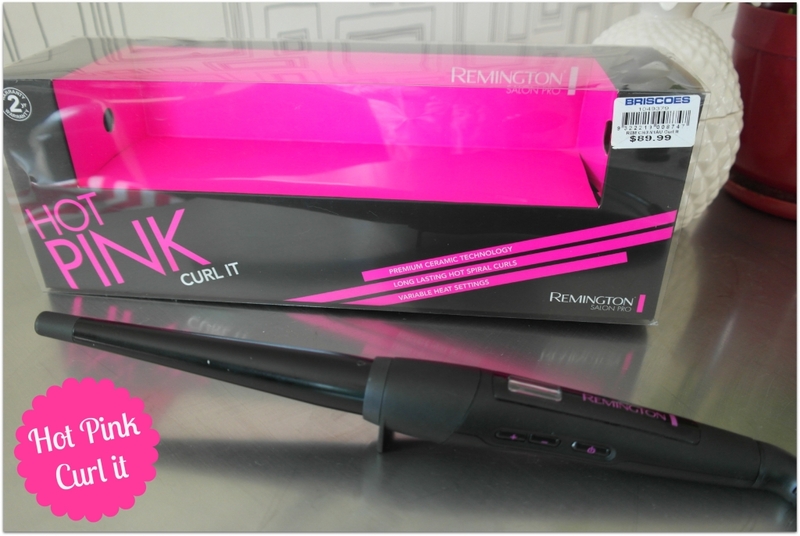 Remington Hot Pink Curl it – I’ve got a blog post coming soon on this ceramic conical hair curling contraption. Frankly, it deserves a full write-up as this impulse purchase has me grinning like a Cheshire cat. It’s got 10 heat settings, ranging from 120C to a high heat setting of 210C. Simply by winding your hair around the tong you get a stunning shiny curl in 7-10 seconds. Since having lots of my hair lopped off I can get a head full of bouncy curls in under 10 minutes. The girls at work were admiring my curly locks recently and asked me to take this into the office to do a demo. They were sold and I understand this affordable hair gadget made a few wish Christmas wish-lists! NZ$53 from Briscoes in one of their mega sales (I point blank refuse to pay full price for anything at Briscoes). V05’s Give me Texture – I’ve got poker straight fine hair that’s super slippy, silky and flat when it’s freshly washed. Getting it to take any kind of style, including having any volume, is challenging. This ripper of a product is a texturizing powder that you sprinkle on hair roots and the result is some ‘grit’ and volume. At NZ$7 the price also totally spins my wheels. 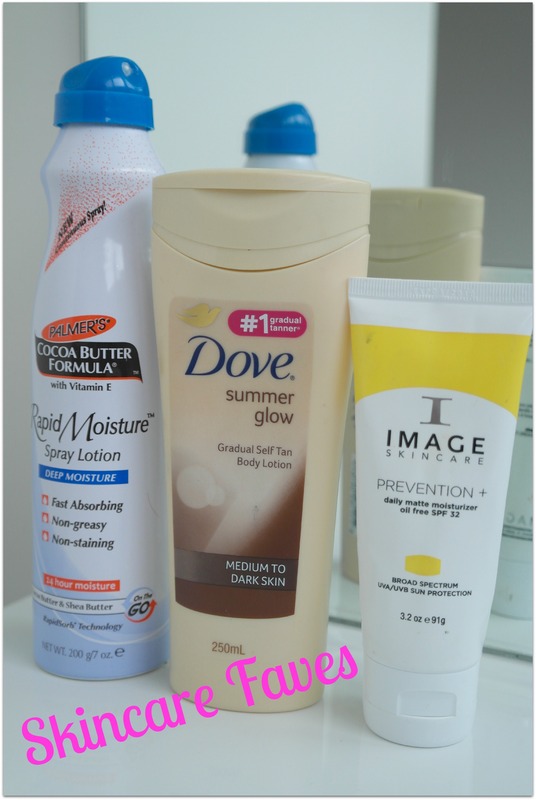 Dove Summer Glow – An oldie but a goodie. This no-fuss, easy to apply, gradual tanning body lotion has been a staple in my bathroom for years. I ramped up its use leading up to my Christmas holiday so my ghost-like glow didn’t frighten off the beach-goers. It worked and I received several compliments on my lightly tanned colour (I happily ‘fessed up the bulk of my colour was out of a bottle!). I whack this on after my shower once or twice a day (yes, twice, I live in Napier, it’s HOT here!). Easy tanning and better still: No skin cancer for me. Oh, no streaks either! Price: NZ$10 from the supermarket. Image Skincare Prevention + Daily Matte Moisturiser – I’ve really mixed up my skincare this year and have invested in some of the Image Skincare range (beautician only products). I love everything I’ve bought so far and mattifying day moisturiser is, hands down, my favourite product for my oily skin. I love: Its matt finish, which seems to help with my skin’s oil production; How it sits under my makeup; The SPF 32 also protects me from harmful sun rays. I forgot to apply my Skinnies (sunblock) on my face a couple of times over my beach holiday and with Prevention + on I didn’t get burnt. Winner. Price: NZ$62. Frustratingly there isn’t a website listing NZ stockists of the Image Skincare range, but there’s product info here and you can email Beauty Sense for a stockist near you. I get my goodies from Fiona at Simply Indulgent in Taradale (she’s a very good egg). 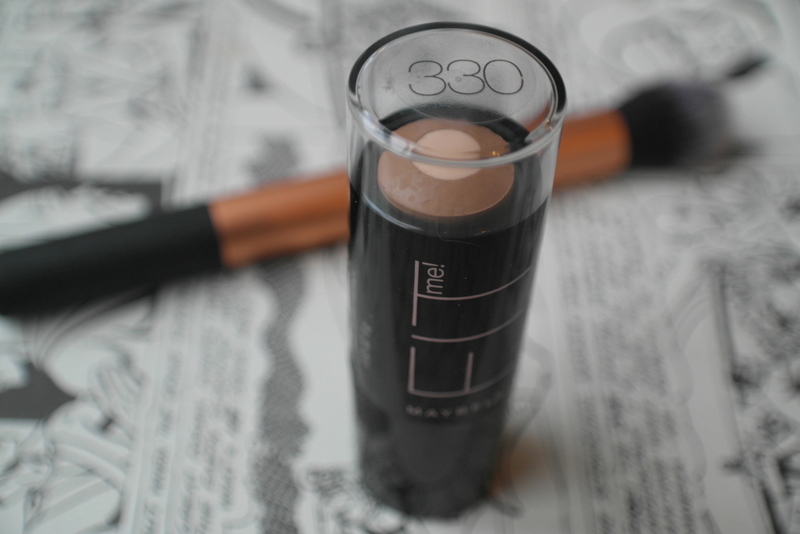 Maybelline FIT Me Stick in colour 330 Toffee – Sorry! 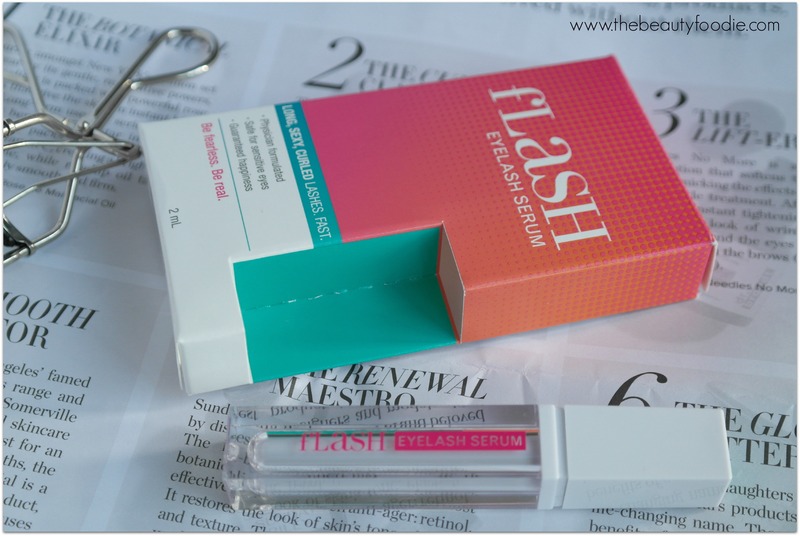 I’m a bad blogger, I’ve only just realised I haven’t mentioned this gem of a product before in my monthly favourites. I use this colour, the darkest available in the range, as a cream contour product. I simply apply some, er, strategic contouring stripes under my cheekbone and around my hairline and blend said stripes in with my Real Techniques contour brush. The result is a nicely sculpted face with the illusion of cheekbones (read “a slimmer face”, necessary as I’ve, err, put on a few pies recently). This is so easy to use and I’m loving the contour effect achieved by a cream contour product as opposed to a powder like a bronzer. I find using a powder bronzer can leave me looking a little, well, over-powdered. Somewhat predictably, I’m also in love with the price: NZ$23 from Farmers or Kmart. 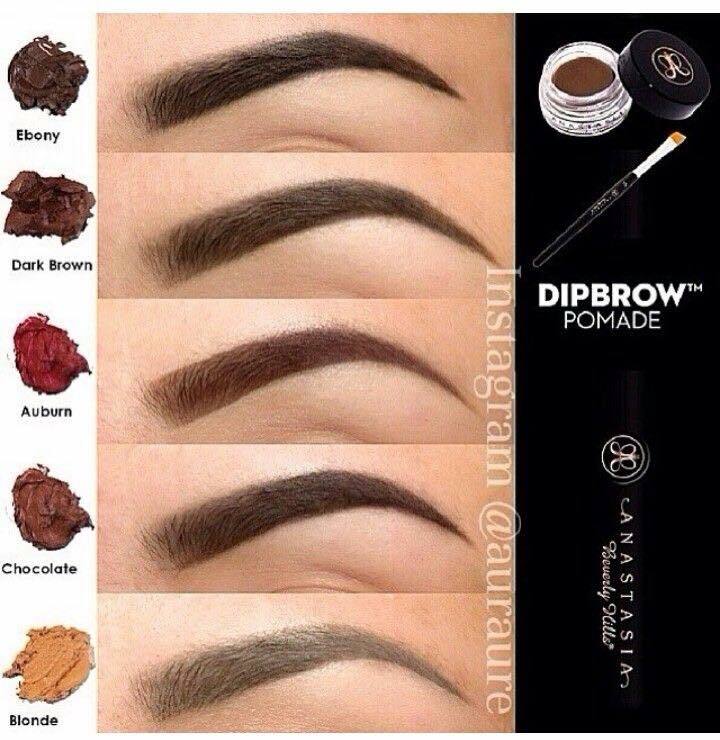 Brow product – Anastasia Beverly Hills Dipbrow Pomade – I’m a bit partial to brow products, have you noticed? Even though I didn’t need it, I succumbed to purchasing Anastasia’s Dipbrow product halfway through 2014 after reading the twentieth beauty blogger rave about it (not that I’m ordinarily a sheep…). Well, this GEM hasn’t left my makeup bag since it arrived. Dipbrow is a waterproof brow colour that comes in a little pot (almost like a gel liner) and it’s the schizzle for sculpting and defining precise brows. 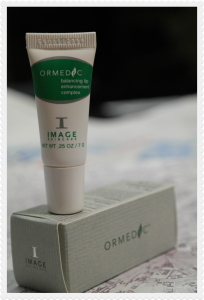 I love it’s smudgeproof-ness (hey, it’s my blog, I can make up words), lasts all day (stands up to quick swim tests) and it looks really natural. I apply this with a fine angled brush (I use an angled bamboo EcoTools brush). Good news, Dipbrow comes in eight colours, so there’ll be a colour for everyone. If your colouring is similar to mine, FYI, I use the colour dark brown and it’s spot on. Price: AUD$20 for a, um, crapload of product which will last me through to 2016, or beyond. I got mine from Beauty Bay with free international postage. Speaking of Beauty Bay, whilst they do ship to NZ for free, a word of warning postage is slow. My Dipbrow took 2-3 weeks to arrive. This time-lag ripped my undies a bit, but it did get here eventually. I probably need to take a chill pill. Lip Product: Image Skincare Ormedic Balancing Lip Enhancement Complex. This ultra-hydrating anti-aging product claims to diminish fine lines. I think I’ve noted a teeny difference but the reason it’s popped up in this ‘best of’ list is, hands-down, it’s the best lip balm I’ve ever used and I’ll be repurchasing a new tube very soon. 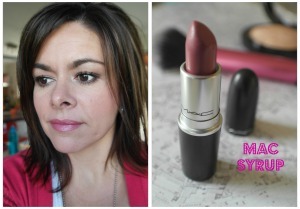 Lipstick: MAC Syrup. It might not last quite as long as I’d like – but the colour is stunning, soft pink with a plummy undertone, kind of like a ‘your lips but better colour’. Funny story, three of my girlfriends and I got this at the same time. It looks different, but lovely on all of us. I thrash Syrup both as a day lipstick and as a night lipstick with a bold smokey eye. I also love it with NYX’s Beige lipgloss over the top (I get this from Makeup Geek). Eye favourites. 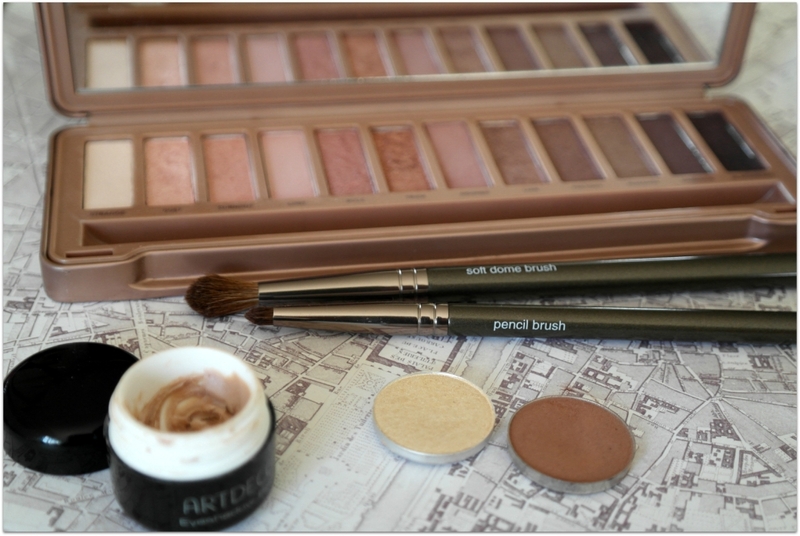 This photo makes me smile… Look at that Naked Palette! (Eyeshadows at the front, MAC Nylon is on the left and Creme Brulee from Makeup Geek is on the right). I might be a little bit addicted to eyeshadows all eye makeup products and picking just a few products, especially eyeshadows, was difficult. So, sod it, I’m picking two eyeshadows and an eyeshadow palette! No1 Favourite Eyeshadow: Crème Brulee from Makeup Geek – I know what you are thinking, seriously, this boring looking eyeshadow is my No1 favourite? Hang on: Hear me out! I’ve used this medium matt brown eyeshadow, which is (apparently) a good dupe for MAC’s Soft Brown, everyday since I got it in late August and I only use it in one way: As a transition colour in the crease of my eye, blended up quite high towards my brow bone using a fluffy blending brush. This serves two purposes: With my pesky hooded eyelids the placement of the eyeshadow high up in my eye crease creates the illusion of a shadow on my hoods which makes them look less puffy. Secondly it blends out any colour I have on my eyelid so that the colour blends out seamlessly. Frankly, I can’t do my eyeshadow without incorporating this colour. Even if I do a silver/grey look, I’ll use a touch of Crème Brulee in my eye crease to bring some warmth to the look. Price: US$5.99. Available online from Makeup Geek (shipping from the USA to NZ and Aussie is very reasonable – and speedy – not sure about the rest of the world, sorry!). No2 Favourite Eyeshadow: MAC Nylon – This is the other eyeshadow I’ve been obsessing over for a while. You know when you think about buying something for ages (like two years) and when you get it you feel annoyed with yourself because you wish you’d get it right back when first thought of getting it? Yeah, I hate that. I’m like that with Nylon. What’s to love? This is a gorgeous and intense pale shimmer eyeshadow colour that I purchased to use, again, in one specific way. This is the perfect highlight for the eye’s inner corner, adding stunning brightness to the inner tear duct. I’ve found another use for it as well, which is to dust a tiny amount of it along the top of my cheekbones with a fluffy blush brush – it gives a gorgeous glow to the cheeks (go easy though, a little goes a long way). On some skintones it would look good as an eyeshadow on the lid, but that looks blah on me (!) It looks almost gold in the pan, it’s not, although it does have a yellow undertone. NZ$38 from MAC. This’ll last you donkey’s years. 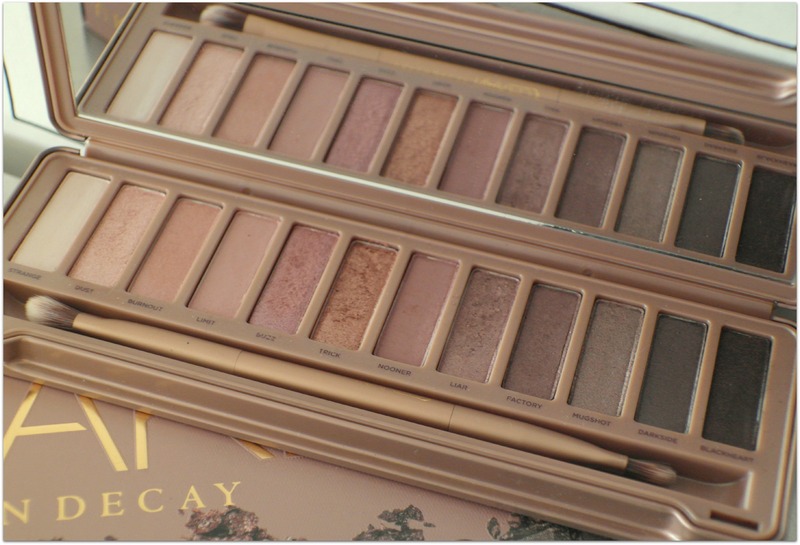 Eyeshadow Palette – Naked 3 Palette from Urban Decay. I own all three of the Naked Palettes, whilst this number three palette isn’t my absolute favourite (my heart belongs to Naked 2 – read about that here), when I look back on my eyeshadow highlights in 2014, this purchase stands out like dog’s balls. Eyeshadow primer – I can’t talk about eye favourites without mentioning my love for eyeshadow primer! Why? Your eyeshadow will last all day, won’t crease and, the colour, oh the colour… Your eyeshadow will apply with oodles of colour! Have you ever applied eyeshadow and thought “I can’t bloody see it?” Get an eyeshadow primer. Thank me later. Art Deco’s Eyeshadow base was a new find for me this year and I’ve since put so many people on to it. NZ$16 from Farmers. Speaking of Art Deco, I’ve bought a good amount of makeup from this affordable range this year and everything I’ve tried floats my boat. Here’s a blog post from May on a mini haul I did. Brushes – I’ve bought a fair few makeup brushes in 2014, including some higher-end brushes from MAC. My favourites? Easy, hands down, top marks to Makeup Geek for two of their eyeshadow brushes. I use both the Soft Dome Brush (aka fluffy blending brush) and the Pencil brush daily. These made my Mum’s Christmas stocking this year, she was rapt. The pencil brush is teeny tiny and is perfect for detailed eye work like smudging eyeshadow along your lower lash line, or blending out eyeliner. These brushes proved to me that you don’t have to spend a fortune on brushes to come up trumps. Speaking of which, I purchased a MAC 224 (tapered blending brush) which does exactly the same thing as MUG’s Soft Dome Brush at three, if not four, times the price and – stinkbum, it’s not as good. Here’s the link to the blog post I did on a Makeup Geek haul earlier this year, you can find out more info here abut these brushes. There’s three of em’ and if you follow me on Facebook, you’ll recognise these titles. 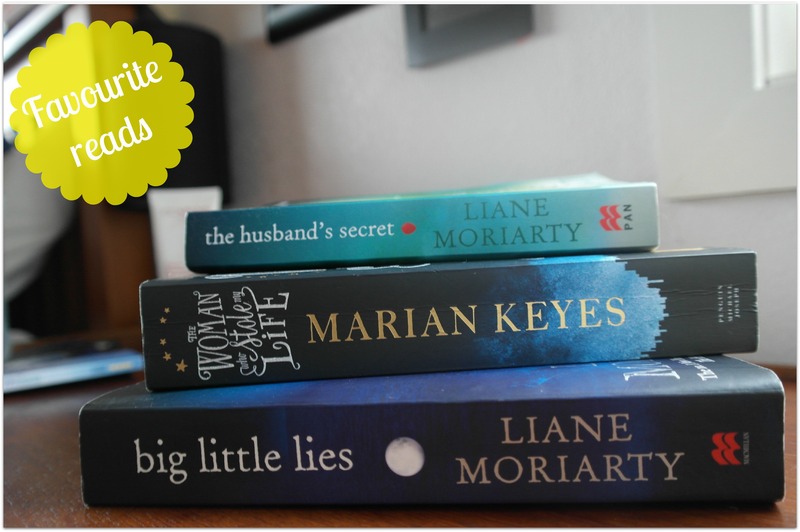 Two are from Liane Moriarty and I devoured both The Husband’s Secret and Big Little Lies. These reads resulted in seriously late nights and mega eye bags with so much puffiness I couldn’t find an anti-puff product that would deal to ’em. Liane offers sensational chick lit reads with more twist and turns than you can poke a stick at. If you get through Big Little Lies without adopting the phrase “Oh calamity” and wanting a Star Wars light sabre, you are doing well. Here’s my blog review on The Husband’s Secret from August.. The Woman Who Stole My Life by Marian Keyes. I’m a big Marian fan and love how she blends together humour, drama and some fairly serious/dark topics. The story centres around Stella, who after spending a year being paralysed in hospital, writes a book about her experience and her life takes off in all different directions.My only criticism of this book was that I got a bit muddled with the chopping and changing timeframes. Other than that, Marian strikes gold again. So that rounds off my beauty 2014 favourites. Have you tried any of these products or read these books? What did you think? What tops your 2014 favorites list?